Last week I posted about my ponderings over what to do for Miss A’s bed quilt I’m wanting to get started on. For her sister’s, I made all granny square blocks…..
and ended up with boxes full of leftover 2.5 inch squares in all these lovely colors. I really wanted to stay with some kind of theme for the eventual trio of mamma made quilts for the girls. So I set out to find a way to incorporate them. Then I found this photo on Flickr and fell in love! What a sweet, a cheerful combination of color and design. I figured it was straight forward enough for even me! 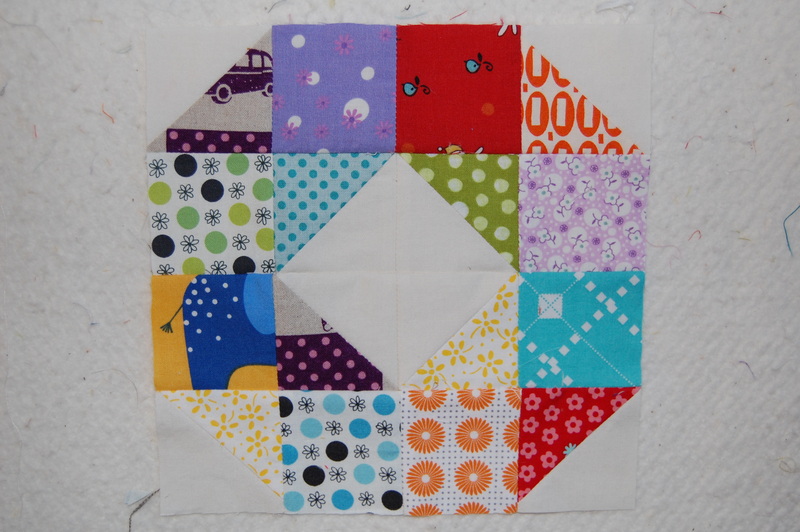 I had to cut more squares to make the right sized HST for the design, but after that, I was on my way. 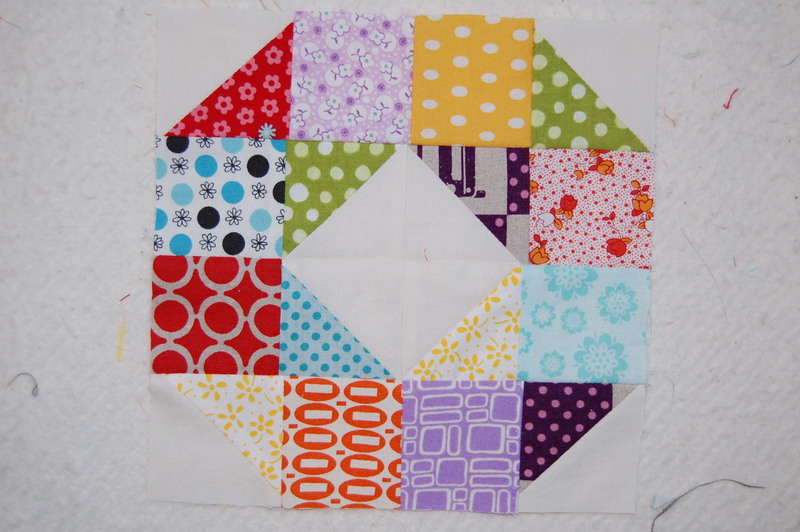 Don’t Call Me Betsy has a great tutorial on this block- she calls it the Patchwork Wheel Block! 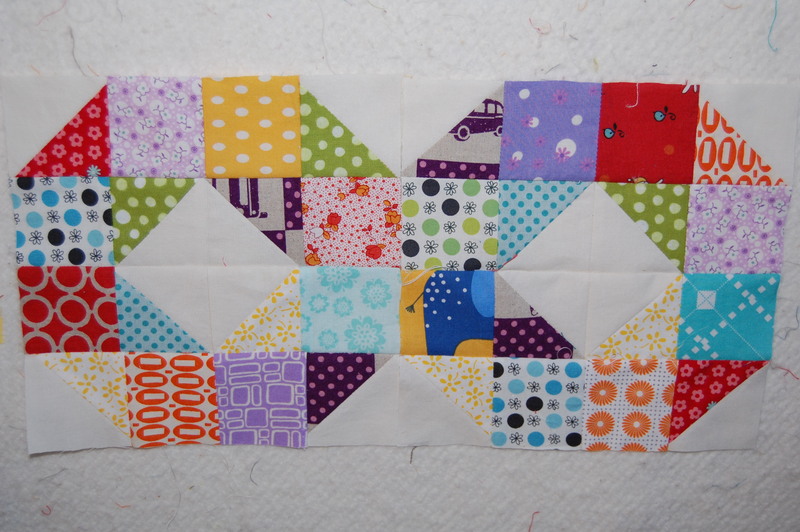 I’m not normally drawn to repeating blocks, at least not if I have to make them! But I just love the mixture of really modern designer fabric with the sweet little 1930’s reproduction prints. Indeed, I have a weakness for really sweet, really cute, traditional with a modern twist, blocks…… and for my little girls, I’ll endure the frustration of trying to create large amounts of them. What I like about these is that I can work on it in little bits and pieces, I get a chance to practice some basic skills, and Miss A can help me design them! It’s a win, win in my book!! I’m linking up with Lee’s WIP Wednesday. It seems folks are really creative and busy this week– lots to see over there!! Ive had that tutorial bookmarked as well. Your blocks look adorable. I hear you on repeating patterns though. Sometimes it is hard to figure out what to do with all the leftovers isn’t it. 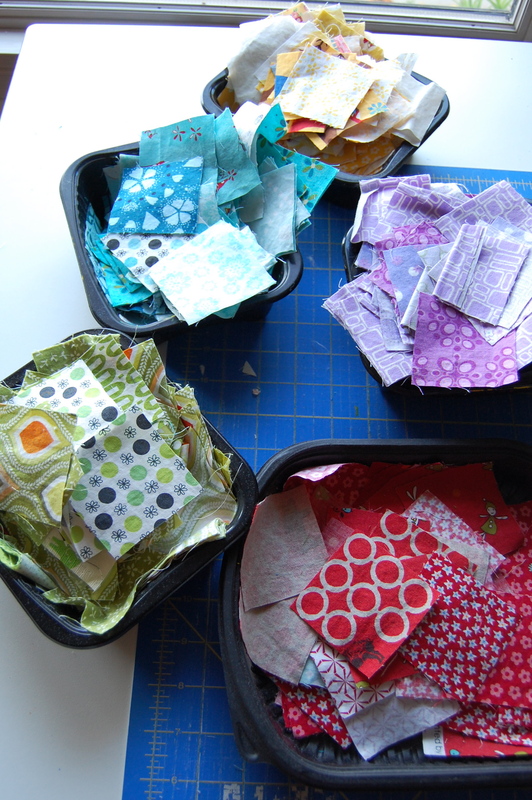 I have a few different sized HST’s I am trying to figure out what to do with currently! You got your trouble all figured out I see—wonderful top for your daughter! Seeing the blocks and then looking at the Flickr inspiration, I wouldn’t have thought it was the same thing. It will be very colorful.